Full texts will be sent to the journals after being evaluated by the conference organizing committee and might be (not guaranteed) published after double blind review process. Eastern Journal of European Studies (EJES) is indexed by SCOPUS and Emerging Sources Citation Index (ESCI – Web of Science). All selected articles proposed for publishing in EJES will undergo a blind review process and will respect the conditions specified at here. Central European Journal of Economic Modelling and Econometrics (CEJEME) is indexed by SCOPUS and Emerging Sources Citation Index (ESCI – Web of Science). All selected articles must be submitted separately via electronic system and undergo standard referee process under double blind policy. Journal of Reviews on Global Economics (JRGE) is indexed by SCOPUS and EBSCO. The topics of the special issue covers all applied economics, finance concepts and social sciences. The selected papers of the conference will enter the review process by Organization committee. There’ll be guest editor from Organization Committee for Special Issue. Authors has to be ensure their manuscripts are original and free from plagiarism and prepare in Native English. Authors should have to pay US$ 500 + Bank Charges directly to the Publisher after approval of manuscripts for publishing. International Journal of Cognitive Research in Science, Engineering and Education (IJCRSEE) is indexed by SCOPUS and EBSCO. The Journal will published some selected papers from ICOAEF’19 Conference. The selected papers will enter double blind peer review process. Quantitative Finance and Economics (QFE) is indexed by Emerging Sources Citation Index (ESCI – Web of Science),Google Scholar, DOAJ. 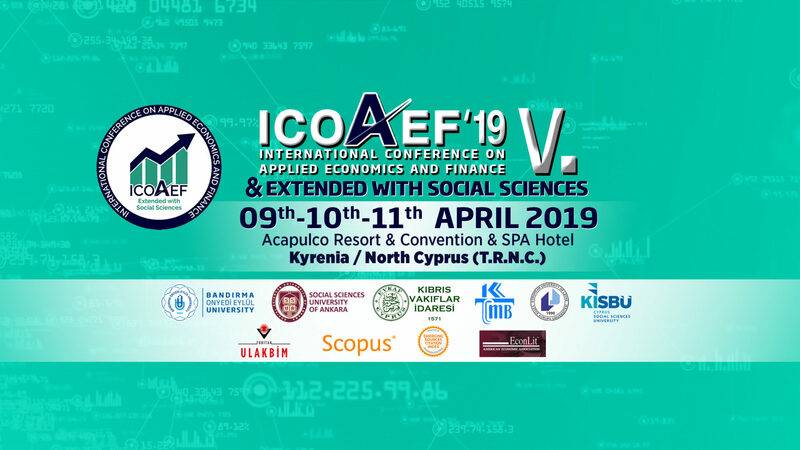 The Journal will published some selected papers from ICOAEF’19 Conference. The selected papers will enter double blind peer review process. De Gruyter Open Economics is indexed by EBSCO, Google Scholar, DOAJ. The Journal will published special issue with five papers from ICOAEF’19 Conference. The selected papers will enter double blind peer review process. European University of Lefke Journal of Social Sciences (EULJSS); Selected papers will be published on 2019 Issues.